The Hard Labor Creek Regional Reservoir Management Board last week agreed to ask the United States Corp of Engineers for a permit extension for construction of an intake facility on the Apalachee River at High Shoals. The Board had voted at its previous meeting in May to go forward with construction of the intake facility, which could be used to expand at some point in the future the capacity of the reservoir now filling in southeast Walton County. Neither Walton County nor Oconee County, partners in the reservoir project, needs water from the reservoir, but the Board moved forward on construction of the intake facility out of concern that the Corps would not grant an extension of the permit to withdraw water from the Apalachee River. Project Manager Jimmy Parker told the Board last week that he now believes the Corps will grant the extension to address concerns about the impact of the intake facility on the High Shoals Historic District. In other action last week, the Board awarded three contracts for construction of the recreational facility planned for the reservoir, keeping on schedule for the expected January 2018 opening of the lake for limited recreational use. Parker told the Board at its Aug. 15 meeting that the reservoir is now about 74 percent filled and should top out between January and June of next year, depending on the amount of rainfall. At present, the Board has not moved forward with construction of a water treatment plant or with a distribution system for the treated water, since neither county expects to need water from the reservoir in the foreseeable future. The reservoir is filling based on the natural flow of water into the Hard Labor Creek basin. Hard Labor Creek is a tributary to the Apalachee River. The intake facility on the Apalachee River would allow the two counties to pump water from that Apalachee River to the reservoir in the future to increase the storage capacity of the reservoir. The permit for that withdrawal of water from the Apalachee River expires in February of 2019, and the Board had hoped to have built the intake facility--though not the piping to get the water to the reservoir--before that time. The Corps of Engineers, which grants the withdraw permits, has raised a number of concerns about the plans presented for construction of that intake facility. Included are questions about the compatibility of the facility with the High Shoals Historic District. The Corps has indicated it wants to hold another public hearing to address that issue. 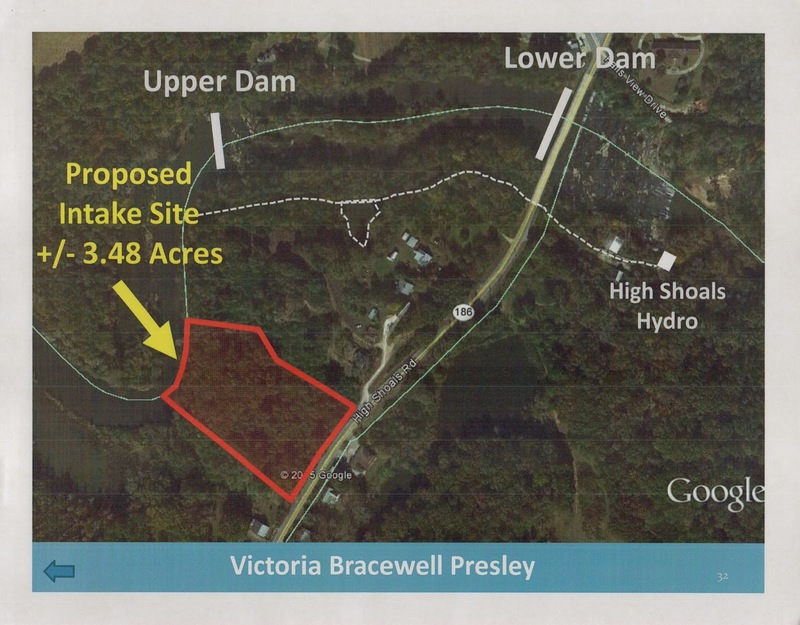 The intake facility is proposed for a 3.48 acre tract between SR 186 and the Apalachee River in Walton County owned by Victoria Bracewell Presley. In 2006, the Georgia Department of Natural Resources Historic Preservation Division designated a historic district on the north and south banks of the Apalachee River at the intersection of Morgan, Oconee and Walton counties. The hourglass-shaped historic district is narrowest at the S.R. 186 bridge across the river. Upper and lower dams used to regulate the flow of water are located on the river above the site of a former textile mill, which was on the south bank. The mill was destroyed by fire in 1928, and only ruins of the foundations exist today. The Presley family, which owns land on both sides of the river, operates a hydroelectric power plant that uses water from the dams on the Apalachee River upstream from the SR 186 crossing of the river. The shoals are downstream from that bridge, as is the power plant itself. The plant is in Morgan County. The incorporated community of High Shoals originally included land on both sides of the river, but that charter expired at some point after the mill was destroyed and population moved away. When the charter was reestablished in 1968, only the part of the original town on the north or Oconee County side of the river was included, and the name North High Shoals was used. At the May meeting of the Hard Labor Creek Regional Reservoir Management Board, Project Manager Parker estimated the cost for the intake structure for the future expansion of the reservoir would be $1.9 million. The two counties have enough money already borrowed to complete the project, he said. The Management Board voted to spend up to $50,000 with Nelson Environmental Inc. of Flowery Branch in Hall County to provide technical assistance in working with the Corp of Engineers on meeting permit requirements. The Board also voted to spend $1,800 with BCP Environmental in Braselton for an asbestos survey of three abandoned trailers on the site. In his financial report at the Aug. 15 meeting, Parker reported the expenditure of $51,564 for the Apalachee River intake in May and June. At the Aug. 15 meeting, before discussing the Apalachee River intake facility, the Management Board awarded a contract of $69,718 to Marine Specialities Inc. of Gainesville for construction of the boat dock and gangway for the recreational facility on the reservoir. The Board also voted to spend $27,384 for security improvements in a contract with Automated Gate Access Inc. of Statham and $13,850 with Robinson Well Co. Inc. of Monroe for a groundwater well system for site. Work will begin on those three projects in September and should be complete by the end of October, according to Parker. Contracts for the remaining two elements of the facility, the restroom septic tank and the paving and striping of the driveway and parking lot, are to be awarded in September, Parker said. Work will begin in October 2017 and conclude by the end of December 2017. The projected opening of the public access recreational facility just south of the rebuilt Social Circle-Fairplay Road and east of the main body of the reservoir is January 2018, Parker told the Board. The county’s plans for the Hard Labor Creek reservoir came up at a town hall meeting the Oconee County Board of Commissioners held on July 13 at the Community Center in Veterans Park. Commissioner Chuck Horton, who serves on the Management Board (but was absent at the Aug. 15 meeting) told citizens present that the county currently has no plans to go forward with a treatment plant at the Hard Labor Creek reservoir and hopes to find ways to avoid the estimated $30 million needed for that facility. Horton said the country is trying to obtain water it needs from the Bear Creek Reservoir located in Jackson County. Oconee County partners with Barrow, Jackson and Clarke counties on that facility. Commissioner Mark Thomas said it might be possible in the future to pipe water from the Hard Labor Creek reservoir, located near Social Circle, to the Bear Creek reservoir for treatment to avoid the costs of a new treatment plant at Hard Labor Creek. Total cost of the project to date is $83.4 million. The video of the Aug. 15 meeting is below. The meeting took place in the Historic Walton County Courthouse in Monroe. Mark Saxon, Oconee County commissioner, is chair of the Management Board and presided at the meeting. Parker is seated at Saxon’s right. The Walton County Water and Sewer Authority held a joint meeting with the Management Board, and members of that Authority are in the lower-left hand side of the images in the video. Discussion of recreational facilities at the reservoir begins at 26:36 in the video. Discussion of the Apalachee River intake begins at 40:46. OCO: HLCMB 8 15 17 from Lee Becker on Vimeo. I had uploaded the video of the May 9 meeting to the Oconee County Observations Vimeo site shortly after the meeting took place, but I did not write about the meeting because of other commitments. Parker is again seated to Saxon’s right in the video. Discussion of the Apalachee River intake begins at 41:20 in the video. OCO: HLCMB 5 9 17 from Lee Becker on Vimeo. NOTE The expiration date for the permit has been corrected in this story. I apologize for the error in the original. When will the eighteen miles of water line to the reservoir be built? When it is much more expensive and disruptive, of course. a water intake facility to nowhere; hope it is not out of date or in disrepair by the time it is needed.